Upon arrival Hanoi, meet up with the tour guide and driver of Vietviewtravel at the airport then they will transfer you to your hotel in city centre. Check in and stay overnight in Hanoi. 08.0am you leave Hanoi for Halong Bay (the World Natural Heritage site) via the Red River Delta. After 3.5 hours driving, arrival at Halong Pier, you check out the junk cruise while lunch is served. You will cruise passing through the magical bay, where thousands of sculpted limestone islands rise from the waves like dragons teeth. After lunch, you take a short trek to a nearby summit for a panoramic view of the bay, swimming on a quiet beach or sunbathing on the sundeck. In the late afternoon, you visit an interesting fishing village with an opportunity to interact with fishermen who have been living in the bay for almost three generations. At sunset, you do kayaking or simply take a bamboo row boat to discover a water tunnel with many coral reefs in a scenic lagoon. Back on board, enjoy watching the peaceful sunset and later unwind at a restaurant. You will stay overnight onboard. The post-colonial capital city of Hanoi is a unique Asian city with tree-lined boulevards, French colonial architecture, numerous lakes, pagodas and temples. This full day tour takes you around Hanoi s most interesting sights, including the Ho Chi Minh Complex, Ho Chi Minh s Mausoleum and his Stilt House, the Presidential Palace and the One Pillar Pagoda nearby. Also on the tour will be the Lake of the Restored Sword, Ngoc Son Temple, the Temple of Literature, and one of the city s museums, either the History Museum or the Ethnology Museum. You will enjoy water puppet show performance and 1 hour cyclo ride around the Hanoi Old Quarter before transfer to the airport for your flight to Seam Riep. Airport picked up and overnight in Seam Riep. Early morning, we will take an opportunity to view the beautiful sunrise at Angkor Wat (optional) and then return to hotel for breakfast. In the same morning, tour to the Small Circuit including Banteay Kdei, Srah Srang, Ta Prohm, Takeo, Thommanon, and Chau Say Tevoda. In the afternoon, visit the Grand Circuit including Prasat Kravan, East Mebon, Pre Rup and Preah Khan. Dinner will be served at restaurant with traditional dance show. Overnight at the hotel in Seam Riep. 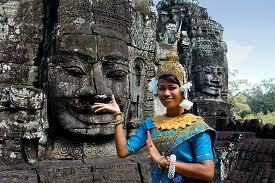 We will take morning visit to Roluos Group including Prasat Preah Ko, Bakong, Lo Lei. In the afternoon, take an appealing boat trip on the Tonle Sap to see the fisherman villages and visit the Siem Reap Market. Overnight at the hotel in Seam Riep. *** The hotels that listed as above are subject to availability of the hotels. In the case of any or all these hotels not being available we will make every reasonable effort to substitute accommodation of similar standard. Customer can choose other hotels which are different from above list then Vietviewtravel's consultant will re-quote the trip base on selected hotels.